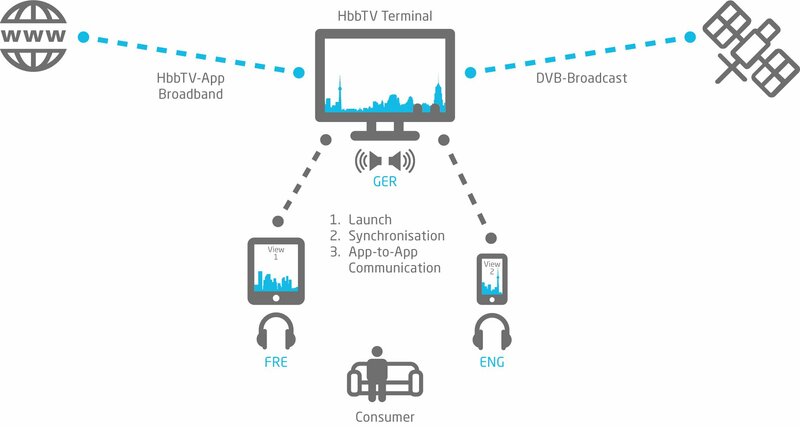 The HbbTV 2.0 specification, published in 2015 by the Hybrid Broadcast Broadband TV (HbbTV) Association, introduces a number of new features that support companion screens and improve the synchronization of broadcast and broadband content. The HbbTV 2.0 CS and Media Synchronization Framework by Fraunhofer FOKUS implements these features. It offers a set of modules and libraries that can be easily integrated in existing TV platforms or broadcaster's services to make them more attractive for end-users. 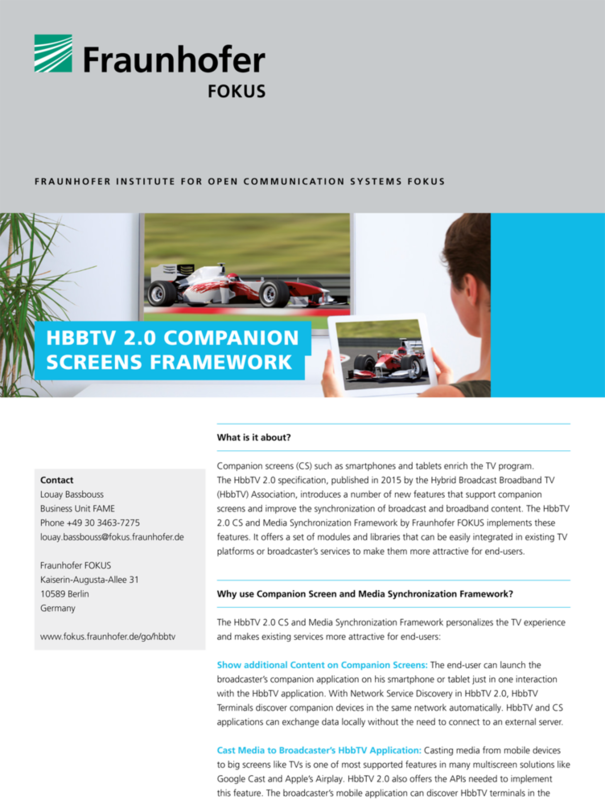 To stay updated on the latest developments of HbbTV 2.0 Companion Screen Framework and news of Fraunhofer FOKUS FAME, please subscribe to our newsletter. Why use the Companion Screen and Media Synchronization Framework? The end-user can launch the broadcaster's companion application on his smartphone or tablet just in one interaction with the HbbTV application. With Network Service Discovery in HbbTV 2.0, HbbTV Terminals discover companion devices in the same network automatically. HbbTV and CS applications can exchange data locally without the need to connect to an external server. Casting media from mobile devices to big screens like TVs is one of most supported features in many multiscreen solutions like Google Cast and Apple's Airplay. HbbTV 2.0 also offers the APIs needed to implement this feature. The broadcaster's mobile application can discover HbbTV terminals in the same network, launch the HbbTV application remotely and instruct it to play a video selected in the companion application. With the Media Synchronization feature introduced in HbbTV 2.0, it is possible to synchronize multiple media streams on TV and companion devices. This allows end-users to play a video (muted) on TV and to select the audio track with the preferred language in the companion application. In addition to audio tracks, the HbbTV 2.0 Media Sync API allows to synchronize video streams on TV and companion screens. In its companion application the broadcaster can offer additional camera perspectives, so e.g. in a Formula 1 race the end-user can select the cockpit camera of his favorite driver. Launching an HbbTV application from a CS application: allows a CS application to launch an HbbTV application on the TV using DIAL protocol. Launching a CS application from an HbbTV application: allows an HbbTV application to launch a CS application on second screen. The FOKUS framework offers a CS Launcher for multiple mobile platforms and supports Push Notification via Google's GCM or Apple's APN. Application to Application Communication: allows an HbbTV and CS applications to exchange data via an App2App Communication Server that supports WebSockets. Multi-Stream Synchronization: allows an HbbTV application to synchronize multiple media streams. It supports Broadcast-Broadband and Broadband-Broadband synchronization. Inter-Device Synchronization: allows to synchronize Broadcast or Broadband streams on TV with broadband content on companion screen. The FOKUS Framework provides also libraries and server components that enable companion screens and media synchronization on older HbbTV 1.x terminals using the same APIs specified in HbbTV 2.0. For information on the further components, please contact us.